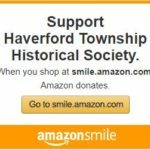 The Federal School Program is a unique and popular living history experience operated by the School District of Haverford Township in conjunction with the Haverford Township Historical Society. Each spring 4th grade students from all five public elementary schools come to the 1797 Federal School to spend a day “living” in the year 1849, and experiencing a school day in our restored one room school house. The Federal School is located on Darby Road, on the former Allgates estate. During the day students enjoy the challenge of learning to write with nib pens and ink. They sew their own copy books, do ciphering (arithmetic) on slates, read from McGuffy’s Readers, participate in a spelling bee, and practice memorization and recitation. During recess they play with typical mid-nineteenth century style toys, such as hoop and stick, “graces” catch game, jacks, wood puzzles, jump ropes and tops. 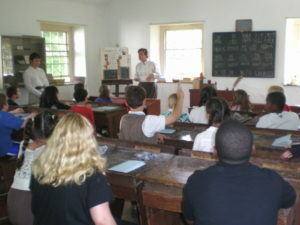 The children have fun trying to adhere to the rules for behavior common in one room school houses, while learning the history of the Federal School itself and education in general. They delight in hearing about the apple for the teacher, the hickory stick and the dunce cap. Many dress in costume, adding to the charm of the experience. The program has been in existence since 1991, and in addition to the public schools also draws classes from private schools and home school programs. This “hands-on” field trip is a curricular introduction to Pennsylvania history, and continues to be a popular precursor to the Colonial Living Program enjoyed by fifth grade students in the fall. Federal School and One Room Schoolhouse “fun facts”. 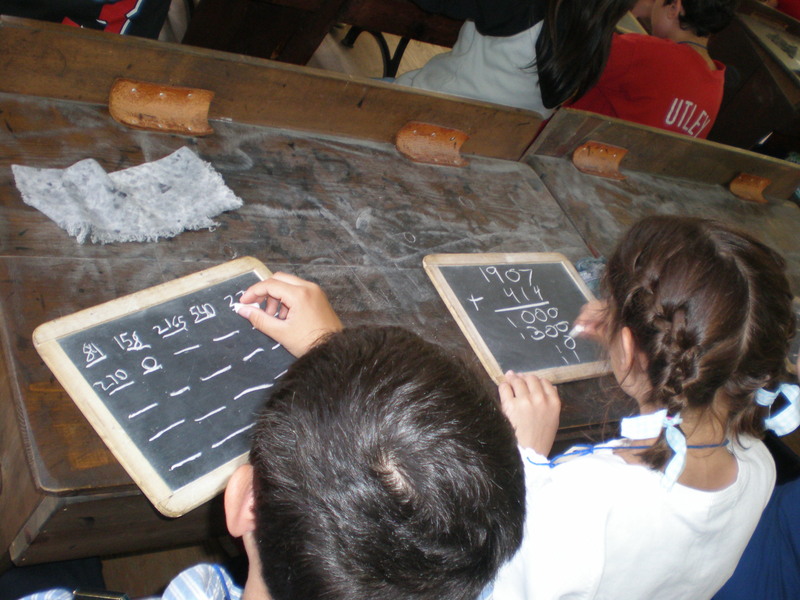 \Students in a one room school house ranged from ages 5 to 18 – all in one classroom. "An apple for the teacher" is derived from the practice of paying for children’s education by providing food for the teacher. Wearing the dunce cap was meant to embarrass students into studying harder, as "dunce" means stupid. Teachers were expected to sharpen each student’s quill pen every day. Female teachers were not permitted to marry. Hornbooks were wooden paddles with alphabet or text samplers covered in thin, transparent layers of horn, and used as primers by students. 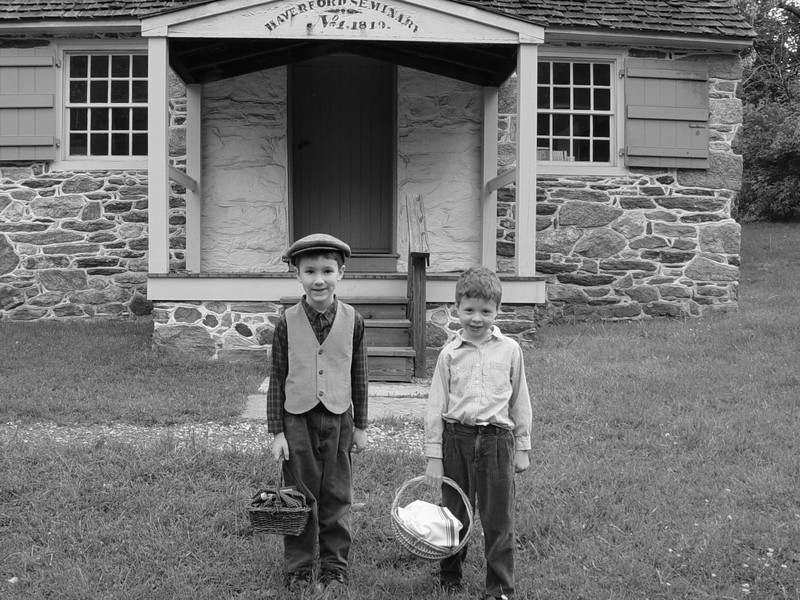 The Federal School was the first building in Haverford Township dedicated totally to education, and was built in 1797. The Federal School has been used as a school, a private home and a storage building. The word "federal" refers to the people’s pride in their new system of government, and does not suggest a state run institution. The Federal School is located on the former Allgates Estate, in the Coopertown section of the township. The Federal School went from a private "subscription" school to a public school in 1849.